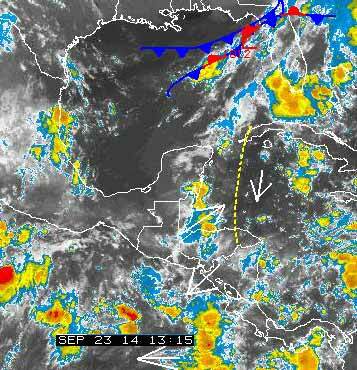 Belize NMS: Relatively moist and unstable conditions will continue. 24-hour forecast: Cloudy with sunny spells today and mostly cloudy tonight. A few showers and thunderstorms will develop mainly along the coast this morning, mostly inland this afternoon, then mainly over the coast tonight. Today: Winds: E-NE 5-15 kts. Seas: Light chop - choppy. Waves: 1-3 ft. A few morning showers and thunderstorms , decreasing. Tomorrow: Winds: E-NE 5-15 kts. Seas: Light chop - choppy. Waves: 1-3 ft. A few morning showers and thunderstorms , decreasing. Marine Outlook: Winds: E-NE 5-15 kts. Seas: Light chop - choppy. Waves: 1-3 ft. A few showers and thunderstorms. Radar stuck on yesterday still.. . . . But that heavy cloud that developed over the Yucatan last night, formed into an ITCZ just south of Belize, then blew in over southern Belize over night bring rain with it. . . .That rain now dying out. I am expecting some scattered rain showers day, but hopefully reducing as the day warms up. . .Staying largely cloudy, but with a little sun occasionally.